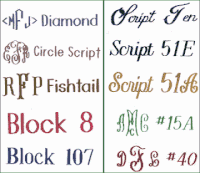 Stocking: Please Choose OnePeaceJoyMerry Personalization: Please Choose OneNoneSingle InitialMonogramName Initial, Monogram, or Name: Font Type: Please Choose OneNoneDiamond (monogram)Circle Script (monogram)FishTail (monogram)Block8Block107Script10Script51EScript51A#15A Font#40 FontCurlyStacked(monogram) Block Stacked (monogram) Thread Color: Please Choose OneNoneRedOrangeYellowDark GreenLight GreenBlueLight BlueDark PurpleLight PurplePinkBlackBrown Who is this item for? These gorgeous needlepoint stockings will add to Christmas Cheer to any mantle. Each generous stocking measures 7.5" x 18".